The wild yak is currently classified as Vulnerable by the IUCN Red List of Threatened Species (2003) and is listed under Appendix I of CITES and Appendix I of the Convention on Migratory Species (CMS or Bonn Convention). The Yak is under first class protection in China and is included in Schedule II, Part I of the Indian Wild Life (Protection) Act of 1972. It was previously classified as Endangered, but was downlisted in 1996 based on the estimated rate of population decline and current population sizes. The latest assessment in 2008 suggested a total population of no more than 10,000 mature individuals according to Buzzard, P. & Berger, J. (2016). "Bos mutus"
According to Tibet Nature Environment Conservation Network there are over 12 million domestic yaks in the Central Asian highlands, but fewer than 10,000 Wild yaks still remain. The only zoo in the world that claims to have a Wild yak is in China. In Qinghai, as of 2000 there were an estimated 3,716 wild yaks remaining. At reported rate of declined (at least 20% of the last 20 years) that would leave an estimate 2,974 Wild-type yak in Qinghai today. (Read more about Treats to Tibetan Yak and Nomadic Herders here). The Wild Yak occurs on the Tibetan Plateau at elevations of 3,000–5,500 m, where it ‘‘inhabits the coldest, wildest, and most desolate [treeless] mountains’’ (Blanford 1888:491). It is currently restricted to a small part of Indian Ladak (Fox et al. 1991; Ul-Haq 2002) and Chinese provinces of Tibet, Qinghai, and Xinjiang, with 1 isolated population on the border of Qinghai and Gansu and another near the northern boarder of Tibet and Nepal (Achuff and Petocz 1988; R. B. Harris, pers. comm. ; Miller et al. 1994; Schaller 1998). The core range of the wild yak has shrunk northward, and only isolated and fragmented populations occur south and east of that core area in northern Tibet and northwestern Qinghai (Fig. 2). The “Long-hair fur forehead yak” is a wild-type that is exceedingly rare with a very restricted range (Fig. 2). These wild-type yak are not considered a “breed” according to researchers - meaning they are not “man-made” through selective breeding (Weiner et al. 2003). As a Wild Yak subspecies they are more at risk then the overall wild-type population. The Tibetan locals agree that this subspecies is only found in the south of Qinghai and only in remote pockets in the highlands of Qinghai. They also seem to differ significantly from the current Chinese Chang Tang Reserve population in a verity of ways. The Wooly and SuperWooly breed in North America are most closely related to the this rare "Long-Hair Fur Forehead Yak” and current generics research bares this out (Read more here). Interbreeding between domestic and Wild Yak presents a threat to the remaining Wild Yak populations in Qinghai (Schaller and Liu 1996, Harris et al. 1999, Smith and Xie 2008, Rawat and Sankar 2011). It is also important to acknowledge that is occurring in the NA yak population as well. The "Long-Hair Fur Forehead Yak”, as the genetic base for this type in the North American Yak population, deserves to be preserved as a Heritage Breed. is illustrated by the dearth of mention of the yak in the West until relatively modern times. Bos grunniens and Bos mutus are the two latin names for separate species of yak in the Bos family. Grunniens is a term that roughly translates to: grunting, and mutus to: mute. The species was originally designated as Bos grunniens ("grunting ox") by Linnaeus in 1766, but this name is now generally only considered to refer to the domesticated form of the animal, with Bos mutus ("mute ox") being the preferred name for the wild species. This is because it was thought that Wild Yak didn’t vocalize, while domestic yak make gentle grunting sounds. This turns out to be untrue and both make these deep rumbling vocalizations. We now understand this does not differentiate between wild and domestic species, sub-types, or breeds of yak. Although most authors still consider the wild yak to be a subspecies, the International Commission on Zoological Nomenclature (ICZN) made an official ruling in 2003. They permitted the use of the name Bos mutus for wild yaks on the basis of prior usage (Bulletin of Zoological Nomenclature. 60: 81–84), however it was acknowledged at the time to be a political decision and not based on morphological differences. This way echoed by IUCN as necessary to protect the Wild Yak and its habit. Wild Yak coats usually show little color differentiation. The color of the wild yak (as seen in the picture) ranges from dark reddish brown to dark brown, jet brown to jet black. This is virtually the exclusive color, but Schaller (1998) reported a golden brown mutation among wild yak seen in the Aru Basin of northwestern Tibet. The black pelage with rust-brown hues (except for a rare light golden-brown mutation in about 2% of animals around the Aru Basin, Tibet, Deasy 1901; Schaller 1998:128). Illustrated by the dearth of mention of the yak in the West until relatively modern times (Weiner et al. 2003), the golden yak originating there may be the result of selective breeding and/or hybridization. This means the color may be a “mutation” arrived at by cattle introgression and hybridization. Domestic yak, on the other hand, can be many different colors or multicolored, and coloration ranges from black to brown, white, and pied (Blanford 1888; Vasey 1857; Wiener et al. 2003). They are usually grey, or brown, or black with patches of white, grey, and brown (called Royals). White yak are considered a breed according to the Chinese. They list the Tianzhu White yak as a modern man-made breed (Lei Huanzhang, 1982; Editing Committee [Qinghai], 1983; Department of Animal Husbandry and Veterinary Medicine in Gansu, 1986; Editing Committee [Sichuan], 1987; Liu Zubo et al., 1989; Cai Li, 1989, 1992; Zhang Rongchang, 1989; Zhong Jincheng, 1996; Bhu Chong, 1998; Han Jianlin, 2000; Ji Qiumei, et al., 2002). In the North American yak population all white yak thus far, have been demonstrated to be cattle hybrids, created in an attempt to design a breed of white yak. The Wild Yak, on the other hand, is typically solid black, with rust-brown overtones, is very rarely golden - never white. Its most likely that these colors are the result of cattle introgression - hybrids (Read more here). Young Wild yaks are dark brown; pelage dense with an undercoat of wool and long coarse guard hairs (Wiener et al. 2003). Thick, long hair covers the Wild Yak’s whole body. Their coat has an inner layer of dense, short, wooly fur or “down” beneath coarse “guard hairs”. A long fringe of hair grows from the wild-type’s lower neck, chest, sides, and thighs, almost to the ground in mature males (#70 cm long—Schaller 1998), and they have a large, bushy tail tail long and bushy on the lower one-half, often described as horselike (Heptner et al. 1989). A color line down the back of the body and behind the withers is slightly grey or darker, and the hair grows longer along their upper spine constituting a "dorsal stripe". There is a ‘‘a sprinkling of gray on the head and neck’’ of older adults (Blanford 1888; Lydekker 1898:53). Many black and brown yaks display a blackish dorsal stripe, like the one discernible in the picture below. In domestic yak there are grey-white hairs around the muzzle that have some wild yak blood. This hair coloring is not to be confused with the skin color of the muzzle itself which can be either gray or black. The Wild Yak has a grey area above the tip of its muzzle. Wild yak are described as having silvery hair as a pale ring around the tip of the muzzle ("muzzle ring”) (Wiener et al. 2003). The Wild type yak horns show the "primigenius spiral.” According to Claude, Guintard (Revue de Paleobiologie 25:259-269, 2006) this is named after the horn shape of the aurochs (Bos primigenius), and the wild yak are identical. The horns extend sideways out of their bases and in a relatively smooth curve, spiral forwards, upwards and inwards. Wild yak, aurochs and kouprey (Bos sauveli) all exhibited this horn shape. 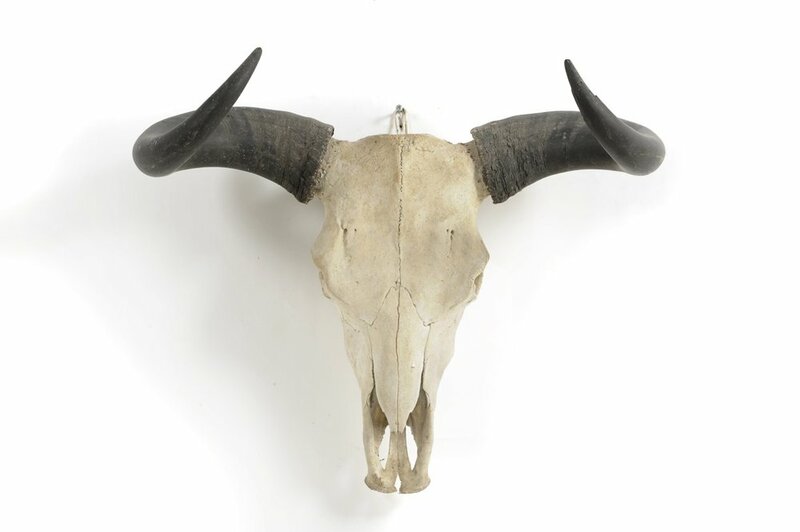 Aurochs and Kouprey are now extinct, so the wild yak is the only species left with this horn shape. Some domestic cattle species (aurochs and yak) may show it to a certain degree, most likely of Maronesa. Image by Miguel Omar Ruíz Hernández, from Breeding-Back, shows the 3-dimensional shape of the aurochs horn. The horns are round and very thick, 15 - 20 cm in diameter. (Some herdsmen used these horns as milking vessels and this can still be found in some remote areas of the country.) The horn arch of the wild yak is open (Figure 1.3), and the head shape has a fierce appearance. The Wild Yak has a large, strong body. While wild-types are larger, they tend to be shyer than domestic yaks, and they are highly sexually dimorphic (males are much larger than females). The females are about one-third the weight and are about 30% smaller in their linear dimensions when compared to bull wild yaks. Wild yak males measure 5.7 to 6.6 feet (175 to 203 centimeters) tall at the shoulder and 11.7 to 12.5 feet (358 to 381 centimeters) long. Females, in contrast, measure 4.5 to 5.1 feet (137 to 156 centimetres) tall and average 10 feet (305 centimeters) long. Wild yaks weigh between 660 to 2,200 pounds (300 and 1000 kilograms). The head and body length is 8.2 to 11 ft (2.5 to 3.3 m), not counting the tail 24 to 39 (60 to 100 cm). Domesticated yaks are somewhat smaller, however less consensus material exists on the variety of these man-made yak breeds (Blanford 1888; Vasey 1857; Wiener et al. 2003). The forehead is ‘‘short, wide, and slightly convex’’ (Lydekker 1913:30). The dimensions of the forehead suggest, in the Wild Yak, it is wider than the head is long (Wiener et al. 2003; Leslie & Schaller, 2009). It is safe to say, many domestic yak have longer faces with skinnier foreheads, which is the opposite of the Wild-type dimensions that are much more like cattle. The yak has a hump just behind its neck. This conspicuous hump pronounced in males, arising abruptly behind the short neck as a result of elongated neural spines of cervical and dorsal vertebrae tapering level at the mid-back (Lydekker 1913) and ‘‘not falling away above the hips’’ (Blanford 1888:490). Buzzard, P. & Berger, J. (2016). "Bos mutus". IUCN Red List of Threatened Species. IUCN. 2016: e.T2892A101293528. Retrieved 3 December 2016. Guo, S.; et al. (2006). "Taxonomic placement and origin of yaks: implications from analyses of mtDNA D-loop fragment sequences". Acta Theriologica Sinica. 26 (4): 325–330. International Commission on Zoological Nomenclature (2003). "Opinion 2027. Usage of 17 specific names based on wild species which are predated by or contemporary with those based on domestic animals (Lepidoptera, Osteichthyes, Mammalia): conserved". Bulletin of Zoological Nomenclature. 60: 81–84. "Bos grunniens (Linnaeus). zsienvis.nic.in". Archived from the original on 16 April 2009. Retrieved 2016-12-03. Leslie, D.M. ; Schaller, G.B. (2009). "Bos grunniens and Bos mutus (Artiodactyla: Bovidae)". Mammalian Species. 836: 1–17. doi:10.1644/836.1. Schaller, G.B. ; Liu, Wilin (1996). "Distribution, status, and conservation of wild yak Bos grunniens". Biological Conservation. 76 (1): 1–8. doi:10.1016/0006-3207(96)85972-6. Wiener, Gerald; Jianlin, Han; Ruijun, Long (2003). "4 The Yak in Relation to Its Environment", The Yak, Second Edition. Bangkok: Regional Office for Asia and the Pacific Food and Agriculture Organization of the United Nations, ISBN 92-5-104965-3. Accessed 8 August 2008.Hedges, S., 2000: Bos grunniens. In: IUCN, 2003: 2003 IUCN Red List of Threatened Species, http://www.redlist.org, Aug 2004. Huffman, Brent, March 2004: Yak, http://www.ultimateungulate.com/Artiodactyla/Bos_grunniens.html, Sept 2004. Oliphant, M., 2003: Bos grunniens, Animal Diversity Web, http://animaldiversity.ummz.umich.edu/site/accounts/information/Bos_grunniens.html, Sept 2004. Sathyakumar, S., and Bhatnagar, Y.V., eds., 2002: Mountain Ungulates, ENVIS Bulletin: Wildlife and Protected Areas, Vol. 1, No. 1, http://www.wii.gov.in/envis/ungulates/chapter2.htm, Sept 2004. Schaller, George B., 1998: Wildlife of the Tibetan Steppe, The University of Chicago Press, London. UNEP World Conservation Monitoring Centre, Oct 2001: Wild Yak – Bos grunniens, http://www.unep-wcmc.org/species/data/species_sheets/yak.htm, Sept 2004.